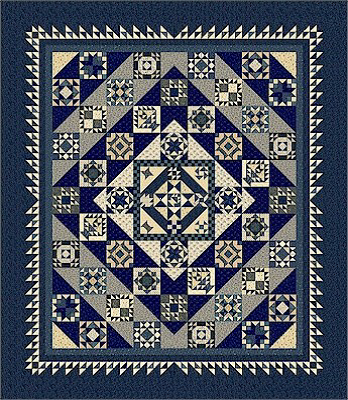 Join Louise each month in class to work on the blocks for this beautiful quilt by Pam Buda for Marcus Fabrics. Each month you’ll receive fabric for the blocks and a selection from Mrs. Miller’s diary. The quilt features several gorgeous Indigo blue prints as well as light prints that make these sampler blocks sparkle! Over 18 yards of fabric included in the kits for the top and binding. Stop by the shop to see the sample and these lovely fabrics in person. Class meets the second Wednesday of the month from 6-9pm. This purchase reserves your spot = Class fee: $120 + Mo 12 Kit/Down Payment $24.99. Kits for mo 1-11 are $24.99/mo. Date(s) & Time: Jan-Dec 2019; Class meets the second Wednesday of the month from 6-9pm. Note: The EZ Angle Ruler is required for this class.